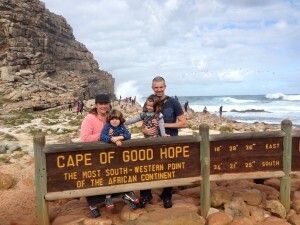 Deserving of its own blog entry is the Cape of Good Hope, the most Southwestern point on the continent. We expected this to be a highlight of our trip to Cape town, and it did not disappoint. On our drive down, we stopped to watch the enormous surf breaking out at sea and on the rocky shore before starting our climb up to the peak at the point. Eilir and Phineas made the entire steep climb themselves on foot, not asking to be carried even once. Eilir was summoning up her fairy powers to grant herself energy boosts. I stole a few from her as well. We encountered an aimlessly wandering ostrich on the climb, which added a surreal element to the hike. At the peak was the very first time I heard the kids proclaim something in nature “beautiful”. Normally this term is saved for things that sparkle or shine and are absolutely manmade. Both kids proclaimed this hike and day to be, “The best day ever!” There’s hope!